Gray horses have an admixture of colored and white hairs over a dark skin. Graying is a process that occurs with ageing so that gray horses are born some other color and eventually look almost white (though they are not genetically white horses, which are actually very rare). The graying gene causes a more or less gradual change in the underlying coat color. Sometimes people describe gray as being, for example, rose gray, steel gray or dapple gray. Although these may represent accurate descriptions at the time such horses are at a particular stage of the graying process and will change over time. Steel gray horses, for example, may be young gray horses with a black base color. They will change as they mature, perhaps through a phase of dapple gray before going almost white. The gene which determines whether a horse will be gray has two alleles, which are symbolised G+ and GG. The GG allele is dominant so that gray horses are of genotypes GGGG and G+GG, while G+G+ horses have coats of some other color (non-grays). Because the gray allele is dominant heterozygous gray horses can have foals of other colors, depending on their genotype for the other color genes. For example we’ll consider the probability of a gray foal from a gray mare and a chestnut stallion. The chestnut stallion is of genotype G+G+ (i.e. is homozygous for “non gray” alleles). 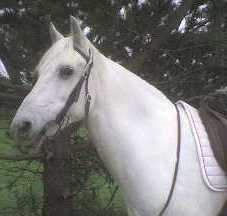 The gray mare had only one gray parent herself and so must be heterozygous for the gray allele, i.e. of genotype G+GG. On average half of the foals will be gray, while the others will be some other color that depends on the underlying color of the mare. The inheritance of gray illustrates epistasis. The GG allele is epistatic (not dominant) to E and e at the extension locus, and to alleles at other horse color genes also. Horses with at least one copy of the allele GG go are gray horses regardless of the genotype at the other genes controlling coat color. Consider, for example, that we had a gray heterozygous mare and stallion (both of genotype G+GG) who were also heterozygous for the allele e, that causes chestnut when homozygous (i.e. they are therefore both of genotype E+e). The gametes from each horse would be of four types, any of which are equally likely: G+E+, G+e, GGE+ or GGe. This di-hybrid cross (illustrated below) gives a modified ratio of 12:3:1 (modified from the standard di-hybrid ratio of 9:3:3:1). You can read more about the inheritance of the gene in gray horses on the essential horse genetics page. The grey allele is a mutation of a gene on horse chromosome 25, which was identified by a research team at Uppsala University in Sweden (Rosengren Pielberg et al, 2008). They found that all of the grey horses (and only grey horses) had a 4600 base pair duplication (i.e. repeat) in a non-coding region (an intron) of one particular gene. The mutation occurred in grey horses from 14 diverse breeds, including Arabs, Thoroughbreds and several pony breeds, indicating a common ancestral gene, possibly tracing to an Arab founder. The duplication causes an overproduction of proteins from two nearby genes (in genetics terminology an upregulation of the genes). The researchers think that the grey mutation stimulates the growth of pigment cells, leading to a premature loss of the stem cells needed for hair pigmentation. Unfortunately, grey is associated with an increased risk of developing melanomas. It is thought that about 75% of grey horses older than 15 years develop a benign form of melanoma that can become malignant. The researchers found that homozygous grey horses greyed faster and had a much higher incidence of melanoma. In some heterozygous horses the mutant gene was deactivated in some regions of their body, so normal pigment production has been able to resume, giving the marks known as "blood marks". 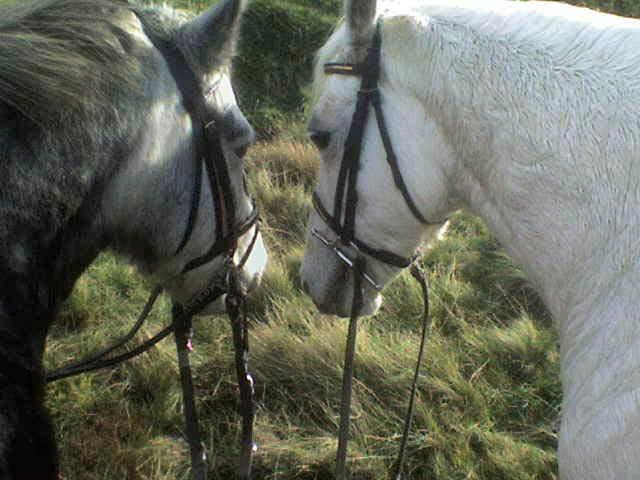 Flea-bitten grey horses develop speckles in the original coat colour, after the greying process has started. This might be due to the same mechanism as blood marking, or "flea-bites" may be controlled by a separate gene, as discussed below. The grey mutation provides a good example of the regulatory power of mutations as an underlying mechanism for phenotypic diversity. No gene products are actually altered. The mutations affect the expression of neighbouring genes - so that they are not properly regulated. Regulatory mutations can and do cause genes to be over-expressed (as here), under-expressed, or expressed at different times and/or in places. Such mutations can have profound affects on phenotype, causing differences both within and between species. 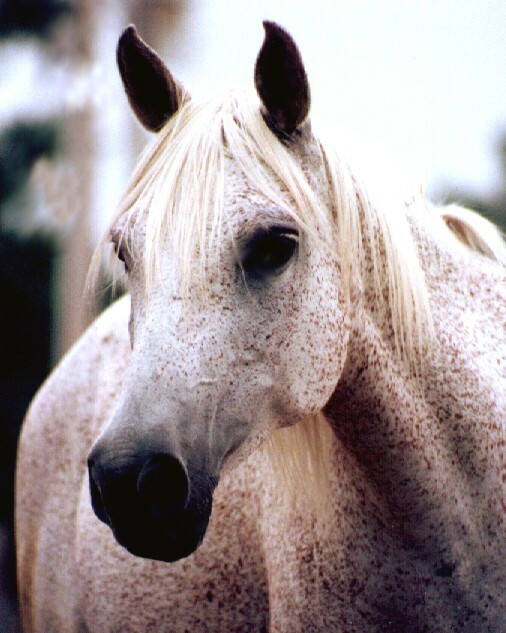 Flea-bitten gray horses develop speckles in the original coat color. For example gray horses born chestnut develop chestnut "flea-bites". If this speckling starts soon enough the flea-bites can become quite large and numerous, with the horse developing to look a bit like a leopard spot appaloosa. "Flea-bites" are thought to be controlled by a separate and probably recessive gene, not linked to the gray gene. It is possible that other colors of horse can have the flea-bitten genotype, but the speckles wouldn't show since they are the same color as the coat!